Trim the fat, pat the lamb dry, tie with butchers twine and generously season it with kosher salt and fresh ground black pepper. Let the leg of lamb stand at room temperature for 1 hour. Stir together in a bowl the garlic, parsley, rosemary, thyme and olive oil. Coat the leg of lamb on all sides with the Dijon mustard. Pack ½ of the herb mixture on the underside of the lamb. Place the lamb, fat side up, on a rack in a large roasting pan. Pack the remaining herb mixture on the top and sides of the leg of lamb. 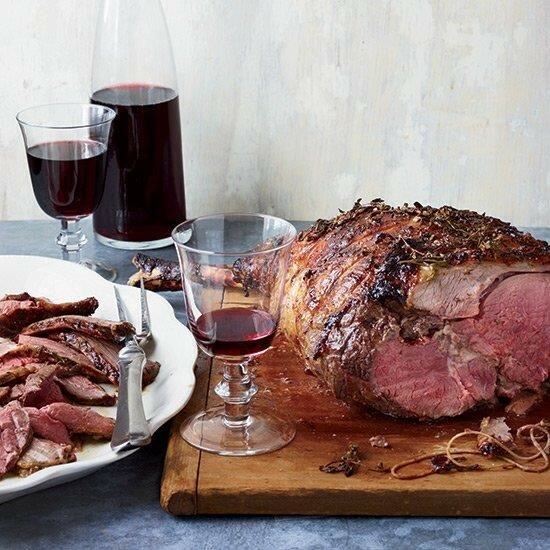 Place the leg of lamb in the oven and roast for 30 minutes. Reduce the oven temperature to 350 degrees and continue roasting until an instant-read thermometer inserted into the thickest part of the meat, away from the bone, registers 130 degrees for medium-rare, about 1¼ to 1½ hours more. Baste the honey every 10 minutes on the leg of lamb during the last 30 minutes of cooking. Transfer the lamb of lamb to a carving board, cover loosely with aluminum foil and let it rest for 20 minutes. Remove the butchers twine and carve the leg of lamb into thin slices. Arrange the lamb on a warmed platter and serve immediately.